i'm going to make this a short post because no one really wants to read anything complicated as we're all probably still food-coma'ed from all the festivities. i can only use "it's the holidays" as an excuse to inhale sweets, carbs, breads, and food for a few more days. which also reminds me, 2017 is coming to an end. recap on 2017- that's for another post. i told you in an earlier post that brown butter would be making its way here frequently. the original recipe for this calls for regular melted butter, which i'm sure is delicious, but please- just try the brown butter. it's worth it. and just so you know, i hate nuts in baked goods like banana bread and chocolate chip cookies, but it's so, so, so delicious here. i'm pretty sure these blondies changed my perspective just a tad on nuts in baked goods. but please, leave them out in my banana bread and chocolate chip cookies. 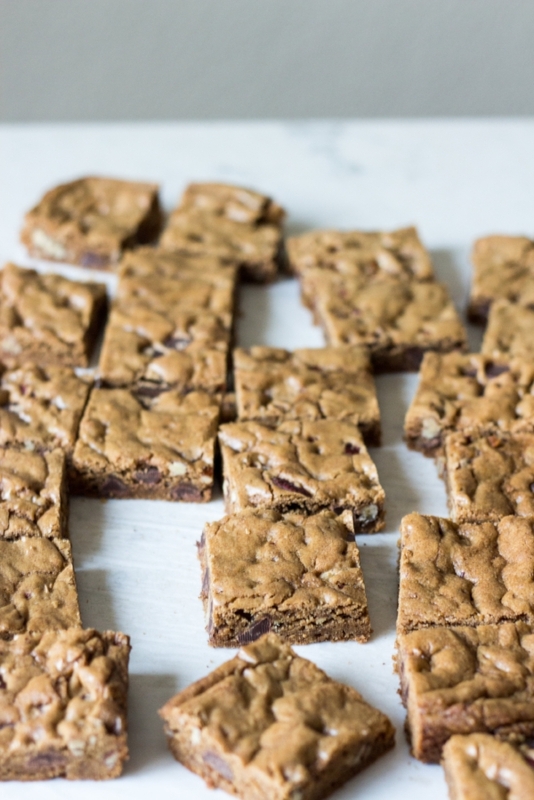 these blondies are are thick and chewy and a bit nutty from the brown butter and roasted pecans. but the special factor is the coffee you mix in- the flavor really stands out. 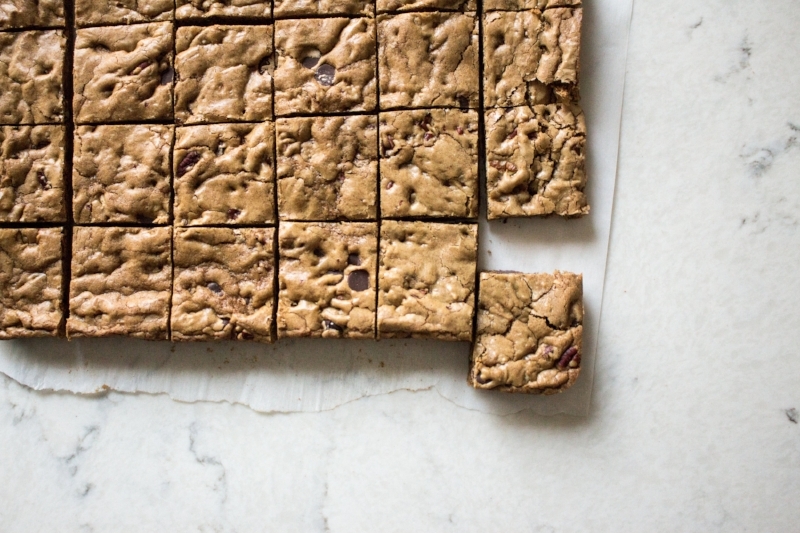 don't go too crazy on the chocolate chips on this one; you really want the coffee to shine. baker's notes: i used instant coffee in this recipe, but i make them by mixing the granules with water in a 5:1-ish ratio- basically until it's really thick like a syrup. I like more coffee flavor in this, but feel free to use whatever works for you. toast the pecans!! the nuttiness comes out so much more when you do so. preheat your oven to 350 f, place the unchopped pecans in a single layer on an unlined baking tray. bake for about 10 minutes until they are golden brown. shake the tray to move the nuts around at the 5 minute mark. cool, chop, then use! brown the butter. follow this here for a more detailed explanation on browning butter. if you don't have time, then don't do it. but i think it's worth it and would only make this recipe with brown butter. also, now i realize this post isn't that short, so recipe is below! brown the butter: set aside a small bowl. melt butter in a medium saucepan over medium-low heat. it's helpful to use a light-colored saucepan so you can see the brown bits as it melts. the butter will melt, then foam, then turn clear golden, and start to brown and smell nutty. stir frequently, and don't take your eyes of it once it melts!! it brown and burns quickly- pour the browned butter into the bowl you set aside. let it cool slightly. preheat oven to 350 F. Grease a 9x13-inch pan and line with parchment paper. in a large bowl, mix together cooled brown butter, brown sugar, and salt. stir in coffee until well-combined. mix in egg and vanilla, and stir until combined. add flour and baking powder, and stir until just combined. don't overmix! stir in pecans and chocolate chips. spread the batter evenly into the prepared pan. it will be thick. bake blondies for 18 to 24 minutes, until set on the edge and top is golden brown, possibly with some cracks. you can test with a toothpick, and it should come out with just a few crumbs. let the bars cool- i usually let them cool in the pan. cut into squares and enjoy! !